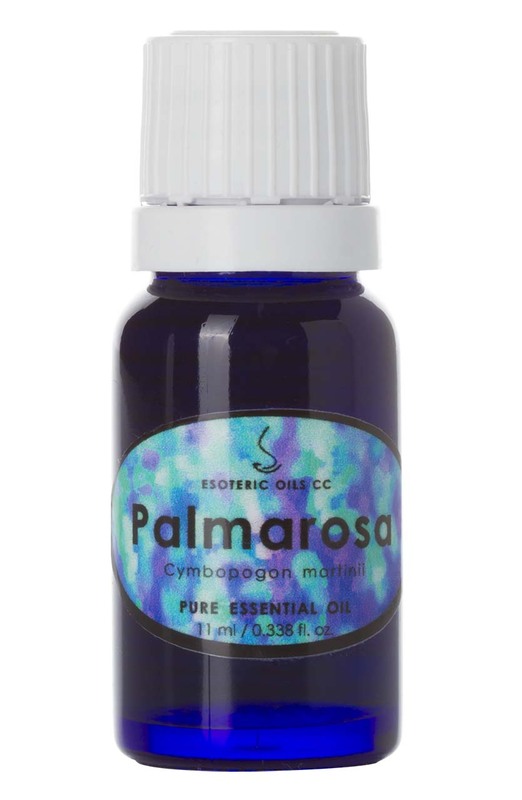 Palmarosa oil has a sweet floral, with a hint of rose smell and is pale yellow in color with a nearly watery viscosity. It is a wild growing, herbaceous green and straw-colored grass, with long slender stems, terminal flowering tops and fragrant grassy leaves. It is harvested before the flowers appear and the highest yield is obtained when the grass is fully dried - about one week after it has been cut. There are two varieties of grass from which the oil can be extracted - motia and sofia. We find the sofia chemotype to be far more active and pleasant smelling - and for this reason the oil sold by us is from this chemotype. Because palmarosa oil has a rose-like smell, it is often used by unscrupulous essential oil wholesalers and retailers to adulterate rose essential oil. Please note - we DO NOT adulterate any oils - we only supply pure 100% natural essential oil. It is often used as an ingredient of soaps, perfumes and cosmetics, and is also used in the flavoring of tobacco. Palmarosa oil is extracted from the dried grass harvested before it flowers by steam distillation. The yield is 1 - 1.5 %. It is most useful during convalescence and cools the body of fever, while aiding the digestive system, helping to clear intestinal infection, digestive atonia and anorexia nervosa. It is effective in relieving sore, stiff muscles. Palmarosa oil moisturizes the skin, while balancing the hydration levels and stimulating cell regeneration. It balances production of sebum, to keep the skin supple and elastic and is valuable for use with acne, dermatitis, preventing scarring, rejuvenating and regenerating the skin, as well as fighting minor skin infections, sore tired feet and athlete's foot. Palmarosa oil can help clear up infections and prevent scarring when added to the water used to wash the wound. When included in creams and lotions, it has a moisturizing and hydrating effect on the skin, which is great to fight wrinkles. It also balances the natural secretion of sebum, which keeps the skin supple and elastic. On cellular level, it helps with the formation of new tissue and for that reason is great for rejuvenating and regenerating the skin. It is most useful when fighting a dry skin and to sort out skin infections. Some people find that they have great results when applying palmarosa oil neat to the affected area of athlete's foot - but please keep in mind that we do not advocate the use of neat essential oils on the skin.